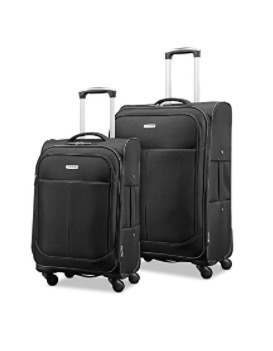 Samsonite Advance Xlt 91333 is a two-piece soft side set of a 21-inch carry-on and a 29 inch- very large suitcases, that is only available on Amazon.com. And you have the two color choices of black (used, 91333-1041) and navy (brand new, 91333-1598). This is not a hard side set but is made of durable fabric and has a nylon lining. 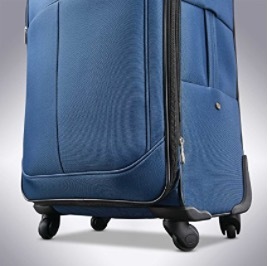 With the Samsonite’s special spinner technology, the wheels spin 360 degrees and in all directions. And you can move them very easily, smoothly and comfortably, with also the help of solid metal pull handles that pull out easily, are easily adjustable for height and lock conveniently. You will find the compression and expansion gussets on both the 21” and the 29”. You will find totally lined interiors and tie-down straps so you can organize your clothes and other stuff properly. You have two padded fabric handles on both suitcases, as well as the aluminum telescoping handles. The total weight for the two of them- shipping is 23.5 pounds and it measures 28.8 x 19.5 x 10 inches. The small carry-on bag measures 22 x 14 x 9 inches including the wheels and the handles.You will get the small cabin luggage fitted into the large 29-inch luggage and this is how you can store them when you’re not using them. Both of them are rather spacious inside. Samsonite, with a history of more than a century, is one of the global leaders and best-known brands in the industry, with a variety of luggage, travel bags and accessories. They have the quality, latest design, innovation, sturdy construction, and durability. Just like the other Samsonite products, this set is also covered by a very generous 10-year warranty by the company. Samsonite Advance Xlt is an imported “Made in China” set but the long warranty by itself is a proof of its great quality and durability, with a company that stands behind its products. You do not need to worry about parts breaking after a couple of uses, but just be careful not to abuse the luggage as that would not be covered by the Samsonite warranty. If you are a frequent traveler, for business or leisure purposes, this set would be suitable for you. Generally speaking, you can expect them to hold up very well as long as you take good care of them. Not being hard shell suitcases they are built with lightweight but good quality components, you will not exceed the airline weight limitations easily. Anyone that posts negative comments about its thin fabric and lightweight assumes that it is not solid and durable enough. But this is so not true, and you really can’t go wrong with the Samsonite brand.